Read any business magazine or report on competing and winning in business today and somewhere near the beginning they will bring up the issue of talent or talent management. Whilst talent management is a topic that the HR industry has focused on for some time, it is becoming a topic of the boardroom. CEOs and the executive leadership in major companies now routinely talk about the ‘war for talent’, and about the need to find and retain the best people. Talent management is getting a lot of attention. But this Viewpoint paper is not a case for talent management per se. In many ways, we are taking that as a given. What this paper is about is the central role that learning and development plays within talent management, and how important it is to effectively integrate learning and development across our talent processes. Effective talent management is about more than measurement and management; it is also about action, i.e. strategies for improving performance and developing talent. Learning and development is not just one of the segments of the talent lifecycle, it is a fundamental enabler of many of the other segments. Learning and development is the engine room of an integrated talent strategy. But first, we should ask who, or what, is ‘talent’? The innocuous question of who or what is ‘talent’ turns out to be remarkably significant, and also a point of significant differentiation between the rhetoric from many commentators in the US, and the realities in Europe. Fosway’s research and advice is normally focused on UK/European-based multi-nationals. Inherently our research lens is therefore slightly skewed towards the views and needs of these kinds of organisations, rather than the US-focused lens of many of the industry analysts. In Europe, our research shows that the ‘talent’ being managed by these kinds of organisations is not all staff, as it purports to be in the US. Talent here typically means a selected subset; executives and senior leaders, high performers, maybe graduate in-take and fast-track members, and in some cases, a new concept, critical talent roles. For an engineering firm, ‘key talent’ is likely to include key engineering staff with deep technical expertise, as well as their execs and leaders. For retailers, talent might also include designers or buyers, or store management. In reality, the exact focus for critical talent tends to vary over time as organisational priorities change, new markets emerge and demographics shift. The focus of talent being a selected subset (or more properly, subsets) rather than all staff is an important difference, and it’s one that creates some challenges for talent management strategies and solutions geared to a ‘talent means all’ definition. With a more focused view of talent, what becomes more important is not commonality of process, but impact from that process. As a result, in Europe, talent strategies tend to be more specifically focused in terms of audience, and more judged on the specific impact or outcomes they create and more differentiated. The reasons that attract people to a potential employer are varied. Most obviously, they include the job opportunity itself, the package or reward they will receive. But research also shows the importance of the reputation of the potential employer and the opportunity for development. In other words, as well as what will I do and get paid, a central attraction for prospective employees is what value the company will add to their career, both in terms of the direct experience of being there, but also how it will develop them and their career options in future. Similarly, when we look at reasons why people leave an employer, top of the list is typically whether they got on or felt valued by their boss and their colleagues. Secondly is dissatisfaction with the job itself, and thirdly is the lack of challenge or opportunity for development. Did the job live up to expectations and did it deliver in terms of advancing your personal and career goals? Clearly development is therefore important, if not central, to the employee value proposition. We join companies because they will develop us, and leave them if they fail to develop us (or fail to continue to develop us). For L&D, this is really important, as it reinforces the central role development has within talent acquisition and talent retention, as well as, of course, being central to talent development, the stage of the talent cycle that sits between the other two parts. That leads us nicely onto talking about the talent cycle itself. We say ‘talent cycle’ because that’s the way the majority of commentators and the industry itself tends to view it, as a lifecycle starting at defining and design, through acquisition, performance, development and to retention. 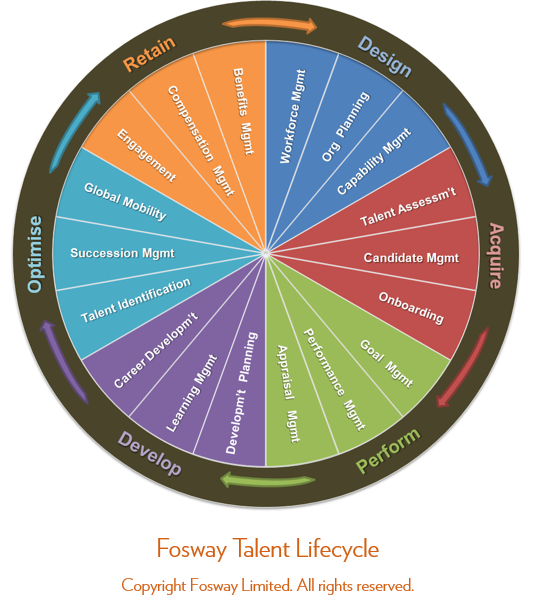 The six phases of the Fosway Talent Management Cycle are: Design, Acquire, Perform, Develop, Optimise and Retain. In our model, each phase consists of three main processes. • Acquire includes Talent Assessment, Candidate Management and Onboarding. Although these processes are shown as part of a lifecycle, with implied connectivity between them, in reality, in most organisations they are anything other than connected. Most organisations will have formal processes (and sometimes systems as well) for many of the processes, very few organisations have processes for all parts of the Talent Management Cycle. And where they do have them, they tend to be functionally separate. Often owned by different parts of the HR functional hierarchy, each area will have its own focus and goals, its own processes and systems (if any), and its own functional specialists that run it. We call these talent silos. The reality of talent management in most companies today is that it is not a suite of connected processes, but a fragmented landscape of disconnected talent silos, operating under and aggregating HR function and functional separate but dependent on the underlying HR system and data. This can be shown in the following diagram. Developing strategies for more effective management of talent as well as the acquisition, development and retention of it must therefore connect these talent silos, as well as look for greater commonality, consistency and synergy between them. This can be a significant challenge, especially if they already have established but incompatible processes and systems, and incompatible goals at the silo level. This is the situation we find within most members of our corporate research network. In fact, it is normally worse than this, as companies have rarely standardised a single process across the whole organisation. There are many sub-variants of each silo across the different business units and geographies that make up a typical multinational. One significant risk for organisations creating talent management strategies is that the only focus on the ‘measure and manage’ part of the talent challenge. Current systems are often so poor that just capturing Talent data looks like a big win. In fact, it isn’t, unless you can do something about it … we will come back to this theme later as well when we get to the key lessons below. Whilst having better systems for capturing the HR data related to these phases is important, the most important metrics are the ones the business already uses for organisational and individual performance. These include things like sales, profit and loss, customer satisfaction, but also order fulfilment accuracy, solution cycle time, net promoter scores, and so on. For the vast majority of organisations, their key day to day focus is on increasing the performance of their staff today. That’s represented by three phases of the talent management cycle: perform, develop, optimise. These are the parts of the talent lifecycle that focus on organisational and individual performance, and the enhancement of that performance. We have already discussed the central proposition for development within the employee value proposition, and therefore on talent acquisition and talent retention. It is now time to focus on – talent development. Organisations must maximise and develop their current skills and capabilities, whilst becoming more agile in developing the people capabilities needed for future success. As we have already discussed, historically many of the talent processes have been managed within separate silos of the HR organisation. Each silo has its own team, goals and focus, and its own processes and systems. Learning plays an essential and valuable role in the talent process but is often significantly undervalued or overlooked. Organisations have a significant opportunity to magnify the benefits of learning by utilising talent management best practices within their learning process, and by effective integration of learning into the talent processes of their organisation. All of these lead to improved learning outcomes and increased visibility of the value of learning. The benefits of technology and automation are also very high. It increases the speed and scale of the processes, brings consistency, and provides more powerful insights through integrated analysis. The multiplicity of the points of integration for learning can be visualised by looking at learning systems, especially how learning management systems (LMS) are integrated into other business applications around them. This is much more complex than integrating with the HR system to get employee data. The following diagram is an example of the typical points of integration from the HR system – in this case from a real Fosway client. The LMS is integrated with a wide variety of applications including HR and talent applications, other learning applications, and a range of work systems, portals and security applications. 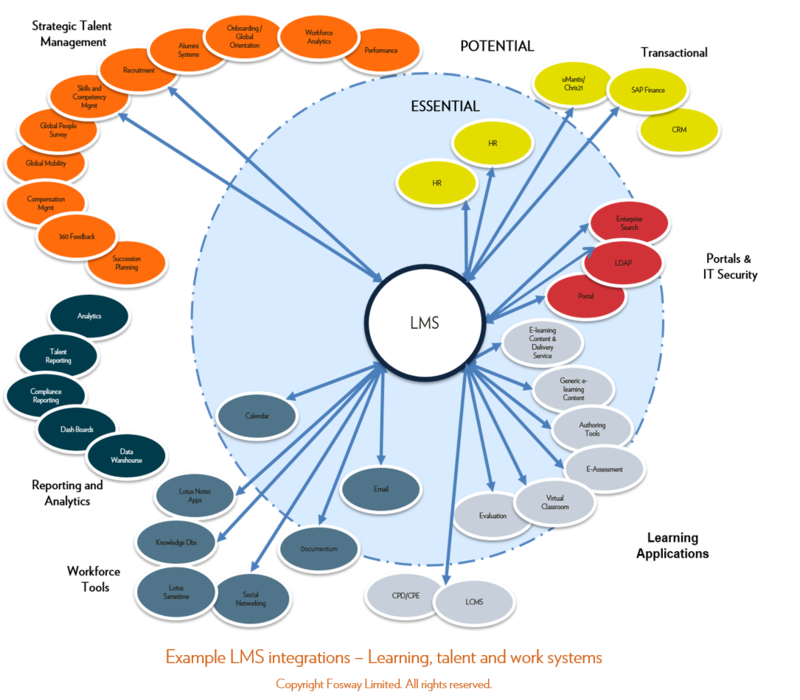 In reality, this version of the diagram reflects a point in time – more interfaces were being added to other talent and work systems to more closely align and integrate the learning offer into these processes. So, if the benefits of integrating learning and talent are significant, why hasn’t it happened already, and what are some of the key lessons that can be learnt in integrating them together? The integration of learning and talent is ultimately a cultural and organisation issue as well as a system and process issue. The talent silos (recruitment, learning, performance, reward etc.) tend to be staffed with specialists who understand their needs and challenges deeply, but lack the more holistic understanding of the whole talent lifecycle. This specialism reinforces silo-specific decision making, and marginalises the opportunities of joined up thinking. The challenge is to change the culture of HR to value connected thinking and behaviour, whilst also not marginalising the deeper knowledge and experience existing in the silos. Even where organisations are restructured in an attempt to break down these silos, unless the cultural mindset changes, the changes are ultimately consigned to failure. The biggest challenge for many HR organisations is the level of disconnect between their talent processes currently. This is not just a systems issue; it is a process and organisational issue. Recruitment, onboarding, learning, development and performance processes are isolated islands, and staff and managers alike often at sea between them, with little clue on which direction to go next. The processes themselves have to become more aligned first, before systems can provided a more connected basis for automation. This will mean creating a common basis for assessing staff that is transferable between different parts of the talent lifecycle. 3. Engine room or heart beat? Learning has a ‘rhythm’ or frequency of need that is much higher than other talent processes. Most talent processes are annual cycles or event-based (e.g. on starting, on leaving, on promotion etc.). Learning happens through-out the working year, and if we include informal learning, all the time. Whether it’s via a user’s capability profile, or providing feedback on future skills gaps, learning inherently provides an opportunity to bring other talent processes into everyday workflow. For managers, the ongoing tracking and reporting of their team’s learning completions and statuses can provide useful clues into the overall talent picture. And this can have very immediate and tangible effects on performance. An LMS in a large company might receive hundreds of thousands of learning interactions every month – most talent systems get a fraction of that during a whole year. This frequency of access provides a foundation for aligning and linking with talent, as well as a source of more frequently updated data on the people doing the learning. Our research with many corporate organisations shows that the most tangible evidence of poorly aligned and integrated talent processes is a highly disconnected user experience between the different talent systems they use. Not only is data not shared between them, but each system typically requires a different login process, a different user interface, and different terminology. Each system has its own learning curve, and for systems that might be only used once a year, that infrequency of use is a disaster. It’s not surprising the users and managers are reluctant to use them. Whilst it might be difficult to fully integrate disparate systems behind the scenes, or to migrate onto one common system, it is usually possible to mask the complexity from the end user. Creating a compelling user experience is a key goal of nearly every new learning and talent system project nowadays. But if that experience is still fractured by different systems, effective usage will always suffer. Beyond the integration of the user experience, is the integration of the underlying talent data itself. Currently each part of the talent process is frequently taking a different view on the same people, each holding its own data, and each requiring its own points of integration with other systems. Simplifying the storage of talent data can only make life simpler and reduce the complexity and risks in systems integration. It also means that more parts of the talent lifecycle are referencing the same records, meaning more points of maintenance of the data, and critically, greater accuracy of data. Processes with an annual update cycle are not good for ensuring accurate data, and we frequently find that user data in the learning management system is significantly more up to date than the equivalent data in the core HR system, or in the performance management system. Proper integration brings the opportunity for Big Data – a holistic view across all of the HR silos, and this enables bigger analysis and more insightful decision making. What is the correlation of performance and onboarding strategies? What is the impact of learning programmes on performance? What are the competencies or skills profiles of your best people? These answers only become clear when you can look across all of the data sets. By the very nature of integrated initiatives, they tend to focus on driving long term value and are often long term projects – integrated talent management is no different. Integrating learning and talent is a long term journey, but the risk is therefore that the benefits only materialise at the end of the journey. We can’t afford that. It is a key commercial imperative to also deliver results today! The challenge for HR is that it needs to deliver against both long term and short term demands. Getting swallowed up into a huge HR transformation project to integrate all parts of the talent cycle could become a strategic bubble that ignores the tangible performance improvements that are needed right now. Strategic projects often fail to deliver any business impact in the short term, and in the long term get devalued, as they look increasingly out of alignment with the changing day to day needs of the business. In integrating learning and talent management, HR needs to ensure a balance between strategic development and tactical performance. In summary, integrating the processes across the talent lifecycle needs to be about more than improving HR processes for measuring and managing your people, it needs to also be about actions to improve business performance; both today and in the future. Learning and development is at the heart of an integrated talent strategy. The pressures to perform within business make it inevitable that organisations (and their HR functions) will continue to give greater attention to the areas that make up strategic talent management. For companies, their people really are one of the biggest assets in modern business, and ultimately are the source of most of their real differentiators in the market. Attracting, developing and retaining people talent is already important but will become business critical to all organisations. The economic cycle distorts these priorities but does not fundamentally change them – especially when you consider key talent or critical talent roles. Increasing the effectiveness of our talent management processes is critical to the longer term success of our companies. But talent management needs to be about action, not just measurement and management. When we look at the ‘how’ of talent management, we find that learning and development is one of the central elements of the employee value proposition (for attracting and retaining key talent), as well as being the central pillar of talent development. Yes, we need to better measure and manage, but just as importantly we need to improve our learning and development as well. That’s why learning and development is the engine room of talent management. Whether it is about onboarding new team members faster and more effectively, raising current business productivity and performance, filling current skills gaps, or by development of strategic capabilities to succeed in the future, learning is key. Effectively integrating learning within the talent cycle can yield big dividends. It enhances the outcomes from other talent processes, it reduces complexity and increases productivity for users, and due to the faster ‘rhythm’ of learning over other talent processes, it also ensures more accurate people data and therefore better analytics. Learning and development is often perceived as a junior partner in the overall HR hierarchy. This is wrong and there’s never been a better time to recognise the role and contribution learning can make and should be making going forward. Development is at the core of the employee value proposition. People want to work for you when it is good, and leave when it is bad. Talent Management is about more than measurement and management, it also needs to be about actions to change or enhance Talent. Learning and development is your central pillar of change, both in driving performance today and in building success in the future. The benefits of integrating learning into talent management are many and significant. It reduces system and process complexity, improves user acceptance and experience, accelerates the value from talent processes, and increases talent data accuracy.